The Worst Bumble Conversation Ever! Brad and I updated our online dating profiles, letting people know that we’ve started Too Old To Date. We felt it was the honest thing to do, since some women might have a problem going out with a guy who writes and produces a show about online dating. After all, though the story is officially fiction, it’s not unreasonable for someone to be worried that their dating life would end up on iTunes (or whatever podcast app you use). The responses thus far have been largely uneventful. Let’s face it, most people just look at the pictures and don’t read anything in the profiles that they’re swiping through. But when Brad came across Eileen, he got a very, very different kind of reaction. Here is there conversation, in full. 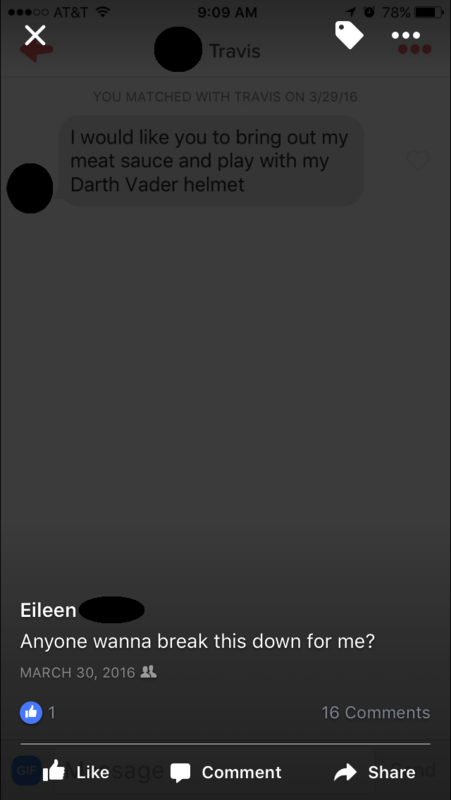 After you’ve read through it, please leave a comment and let us know if you too have been victimized by Eileen. Update: Eileen found Brad on another dating app, and Brad noticed that he had a few mutual Facebook friends with her. 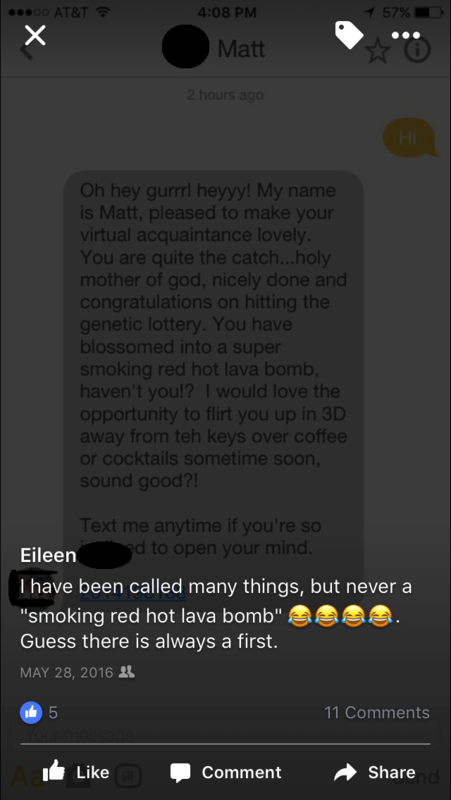 After consulting with them, he learned that Eileen regularly posts screen shots of her dating app conversation fails on Facebook, highlighting guys who say gross things to her [examples here, here, and here]. While these guys certainly deserve to be called out for their lame messages, we noticed that Eileen doesn’t censor their faces, so we did that for her. So what have we learned? 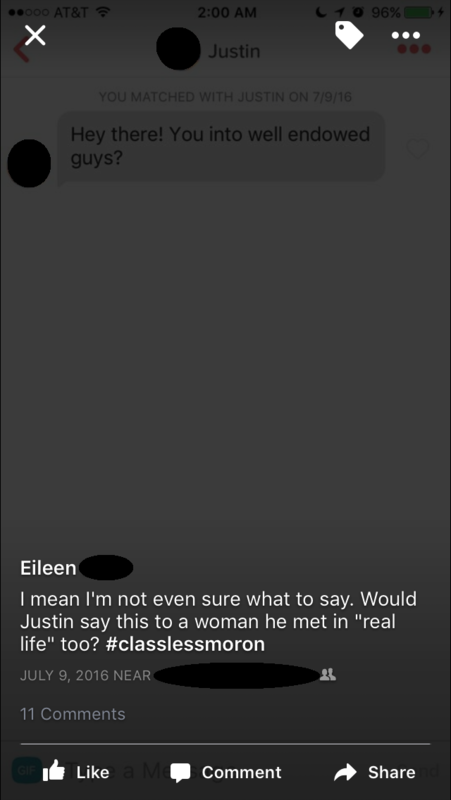 Well we already knew that women get creepy messages on dating apps all the time, and now we know that in some cases, it drives them to post those creepy messages publicly and to engage in conversations bizarre like the one below. That was torment to read. If she really is like that in real life, there is no wonder why she is single and will be forever. They seemed genuinely happy to hear from me. But in typical online dating fashion, conversation naturally faded and nothing came of our quick chat about what it was like to be a film major at the generally business-and-science-heavy UPenn. You should participate in a contest for one of the finest websites online.